There's always a rush during early morning. Nitu has to leave to office pretty early and and i need to cook fast. Time management becomes my utmost priority every morning. My in-laws weren't there for a few days and we both had to manage everything yet more precise at home. 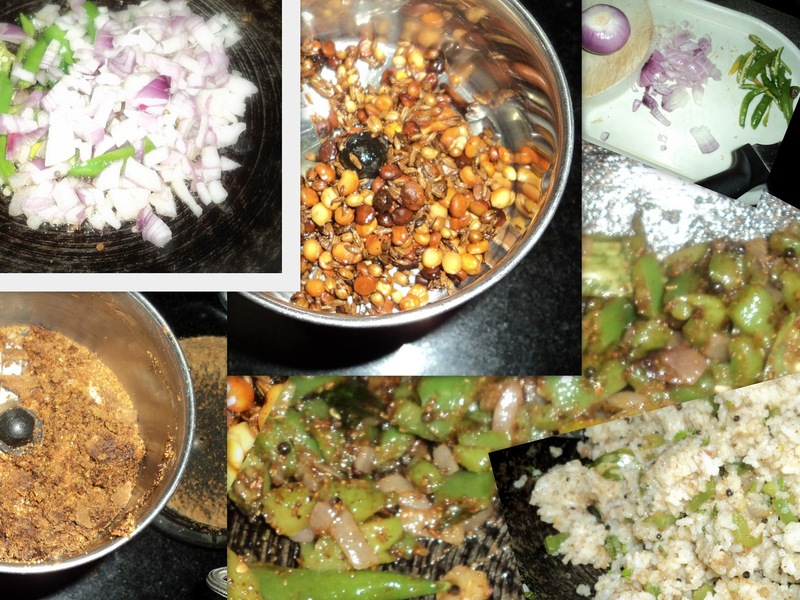 This was a recipe which came to my help when i thought Nitu got bored of regular lunch. Now i feel good to say that this one has become his fav these days. It was a first time success even for a non rice lover like me!! Takes as normal time as one would take to prepare lemon rice. Rice- one cup-- Cook it and keep aside, as you would do for any other rice item. Basmati rice'd be exemplary. I used normal one. Add Oil on a tawa, once its hot, splutter mustard seeds, add few curry leaves(bay leaves), Green chillies, finely chopped onions. Once the onions turn golden brown, add chopped capsicum. Saute only till the capsicum is partially cooked. Let them retain their natural crustiness. Add ground masala and remove from heat and saute until well mixed. Mix it with rice once it is little cool with needed salt and chopped coriander leaves. Tastes best when served hot. I assure it'l be a hit! !